TORONTO -- Kawhi Leonard scored 17 of his 37 points in the third quarter and Kyle Lowry added 22 to bounce back from his scoreless performance in Game 1 as the Toronto Raptors throttled the Orlando Magic 111-82 on Tuesday. Toronto's victory sends the best-of-seven opening-round playoff series to Orlando tied at one game apiece. Three nights after a 104-101 upset by Orlando in Game 1, the Raptors roared back with a vengeance, controlling the game from the get-go. Leonard shot 15-for-22 on the night, surpassing his previous playoff career-high of 14 made field goals set in 2017 with San Antonio, and received a loud standing ovation from the red-clad Scotiabank Arena crowd when he left the game with just under five minutes to play. Pascal Siakam chipped in with 19 points and 10 rebounds, and Serge Ibaka had 13 points. Aaron Gordon had 20 points to lead the Magic, who rode a wave of momentum into the playoffs, matching Toronto's 22-9 record over their final 31 games to grab the No. 7 seed in the Eastern Conference. Former Raptor Terrence Ross had 15 points. The Raptors never trailed, charging out to a 16-point first-half lead which they would turn into 24 points in the third, largely thanks to a spectacular third quarter by Leonard. The Raptors led 90-66 with one quarter left to play. Toronto kept its proverbial foot on the Magic's throat over the final 12 minutes, holding Orlando to 1-for-9 shooting through the first five minutes. Things got heated down the stretch when Michael Carter-Williams threw an elbow to Lowry's face that nearly knocked the point guard off his feet. Lowry shot the technical to put Toronto up by 33 points. With the game easily in hand, Raptors coach Nick Nurse went deep into his bench, and the crowd serenaded Lowry and Siakam when they were subbed off with three-and-a-half minutes to play. Norman Powell connected on a three-pointer soon after to put the Raptors up by 34 points, sending many fans to the exit to beat the rush. 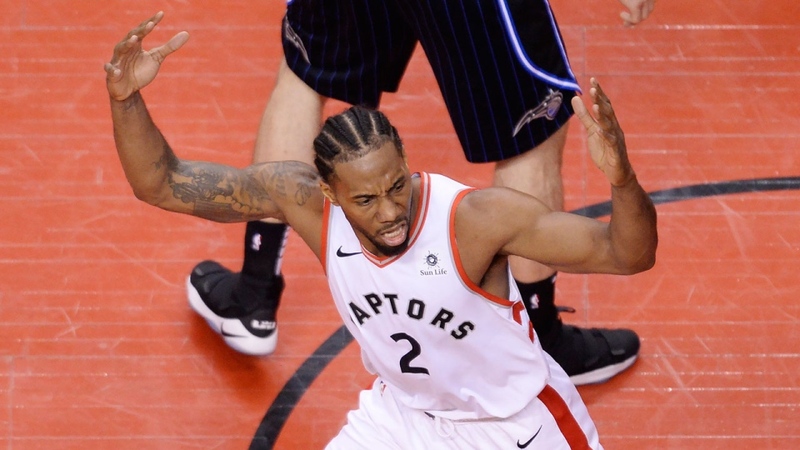 Leonard, who'd been expected to crank his game up a notch when the playoffs tipped off, was brilliant on Tuesday, drawing delighted gasps from the sold-out Scotiabank Arena crowd, and when he drew a foul for a three-point play in a third-quarter in which he mercilessly punished the Magic, the crowd chanted "M-V-P!" Three nights after he scored zero points, Lowry got his first point -- a free throw -- just 92 seconds into the game, high-fiving his wife Ayahna, who was seated courtside, on his way to the foul line. Lowry missed his first, but with the Scotiabank Arena crowd cheering him on, made the second. The crowd erupted. Four minutes later, the five-time all-star drilled a three-pointer on his first field goal attempt. Despite a 58-win regular season, and with a roster built with a championship run in mind, the Raptors dropped an ugly decision in their opener on Saturday, conjuring memories of so many previous opening-day losses and making for a nervous Raptors fan base. But where the Raptors were lackadaisical on defence for huge chunks of Saturday's game, they were locked in from the opening tip on Tuesday, swarming and smothering the Magic, forcing 17 turnovers for 26 points. Toronto committed just seven turnovers for nine points. The Raptors kept Orlando off the scoreboard for the first four minutes, sprinting out to an 11-0 lead. They'd stretch their advantage to 13 points before taking a 26-18 lead into the second. Toronto kept up its torrid pace in the second, and Siakam's two free throws with 2:27 left in the frame put the home team up by 16. The Raptors went into the halftime break leading 51-39.